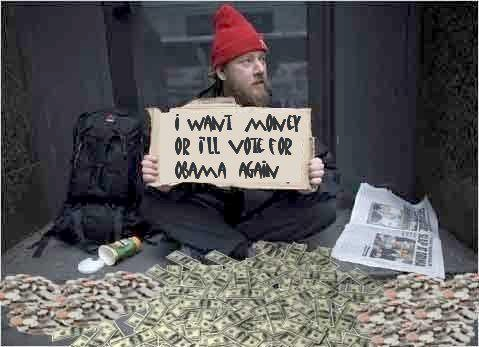 This is obviously a photoshop creation, sort of like this bit of Occupy humor, but let’s suspend reality and give this bum some credit for being entrepreneurial. In the real world, though, the bum probably wouldn’t be this successful because the likely GOP nominee doesn’t offer a pro-freedom alternative. I think high tax rates on certain classes of citizens are immoral and discriminatory. If the government is going to collect revenue, all taxpayers should be treated equally, with something akin to a simple flat tax. But most people don’t seem to care about having the law apply the same to all people, so I make a strictly utilitarian case for low tax rates in today’s New York Post. Here some of what I wrote. I then provide a specific example, looking at how Reagan’s lower tax rates resulted in a lot more revenue from the rich. Unlike the rest of us, the rich have a great ability to alter the timing, amount and composition of their income. That’s because, according to IRS data, those with more than $1 million of adjusted gross income get only 33 percent of it from wages and salaries. The super-rich (those with income above $10 million) rely on wages and salaries for only 19 percent of their income. 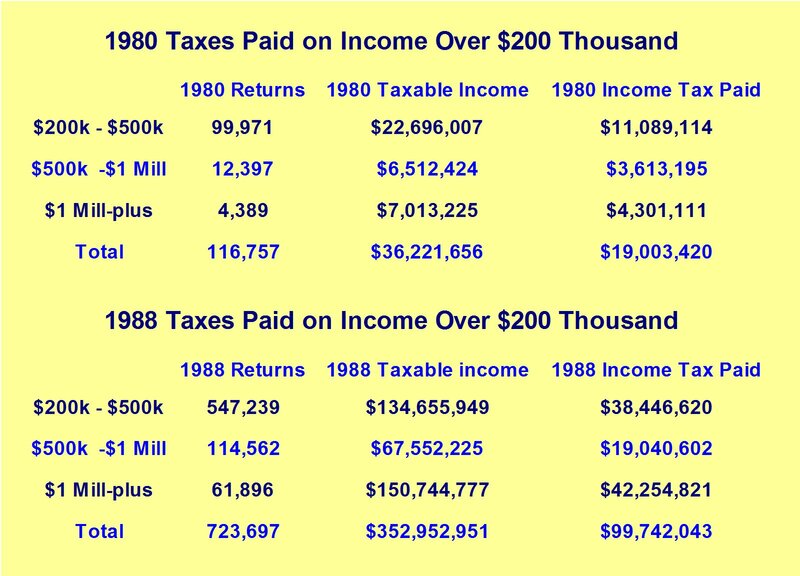 In 1980, when the top tax rate was 70 percent, rich people (those with incomes of more than $200,000) reported about $36 billion of income; the IRS collected about $19 billion of that amount. So what happened when President Ronald Reagan lowered the top tax rate to 28 percent by 1988? Did revenue fall proportionately, to about $8 billion? Folks on the left thought that would happen, complaining that Reagan’s “tax cuts for the rich” would starve the government of revenue and give upper-income taxpayers a free ride. But if we look at the 1988 IRS data, rich people paid more than $99 billion to Uncle Sam. That is, because rich taxpayers were willing to earn and report much more income, the government collected five times as much revenue with a lower rate. I also included above, for readers of this blog, a table with the raw numbers from the IRS. Feel free to click for a larger image and see how the “rich” responded to better tax policy. I then close with a warning about Obama’s class warfare policy. Obama wants to run the experiment in reverse. He hasn’t proposed to push the top tax rate up to 70 percent, thank goodness, but the combined effect of his class-warfare policies would mean a big increase in marginal tax rates. That might be good for workers in China, India or Ireland, because American jobs and investment would migrate to those places. But it’s not the right policy for the United States. In other words, even if you’re a leftist and your main goal is giving the government more revenue, higher tax rates are a bad idea. The rich will simply figure out ways to protect their earnings while the rest of us suffer because the economy loses some of its dynamism.